Hello! Today is the Wplus9 Group Post and release day. Be sure to stop by the Wplus9 store to get your hands on the latest sets: Flora & Fauna I, Spring Post & Postmarked. 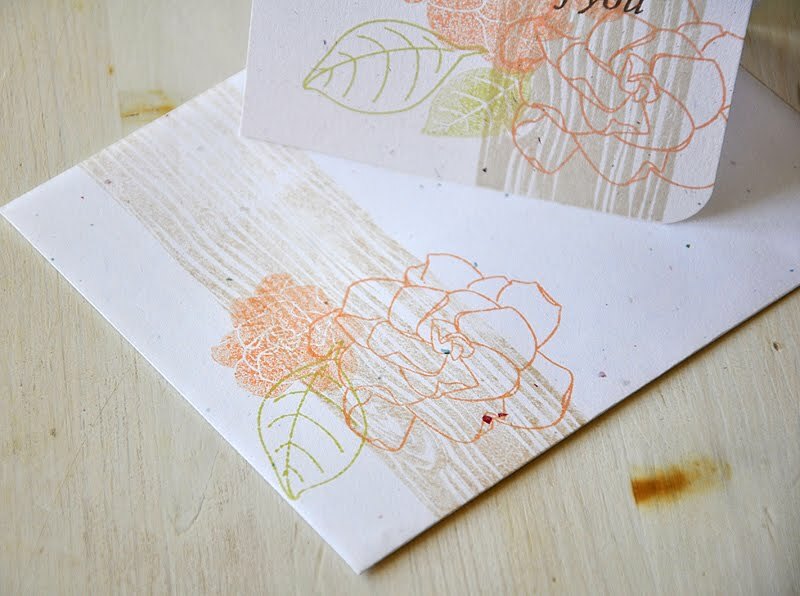 Today's card started with a kraft card base, which I stamped with the Dogwood image in Dark Chocolate ink. 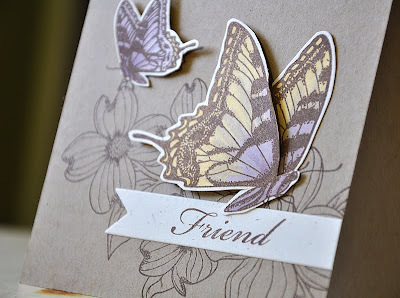 Then stamped a Rustic Cream sentiment strip with "Friend" (from Spring Post) and attached. 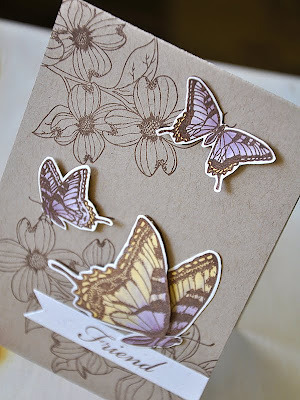 Stamped the butterflies onto both the card base and Rustic Cream cardstock. The butterflies on the Rustic Cream cardstock I colored (in purple and yellow) with Copic markers, cut out and attached over the butterflies on the card base. For added dimension, the largest butterfly was stamped twice, cut out and layered. Thanks for stopping by, hope you enjoyed! Have a great day! Hello, it's me again! I'm back with a sneak peek at two new sets from this months Wplus9 release. 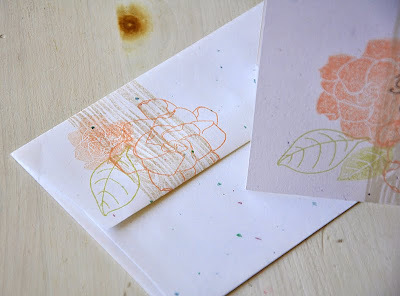 Spring Post & Postmarked...be sure to check out the details here. 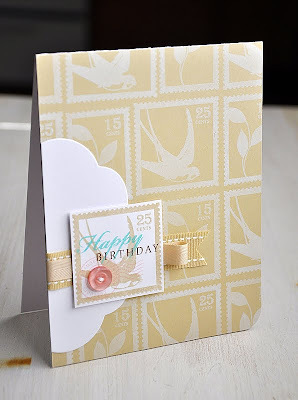 To start, I stamped a Fine Linen card base with a couple of the postage stamp images (from Spring Post) in Fresh Snow ink and then rounded the bottom corner. It was super easy to perfectly align and stamp these gorgeous images. Love the way it turned out! Attached and trimmed a white Mat Stack #5 to the card base. Stamped a single postage stamp image, sentiment and a post mark onto white card stock and cut out. Then attached it over Fine Linen ribbon strips and embellished with a Sweet Blush button. Every time I use this set, I think of my Mom. 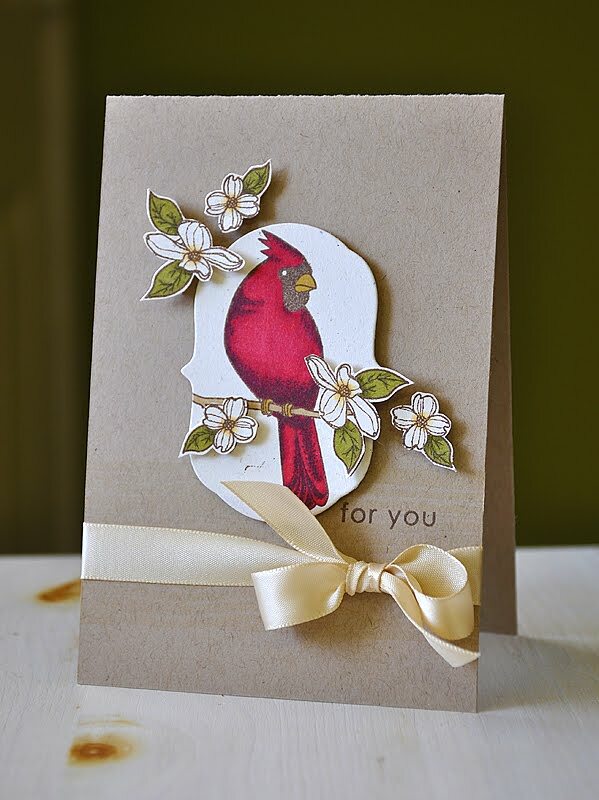 Dogwood and Cardinals are her favorite! How perfect is it that these two are featured together in one set. 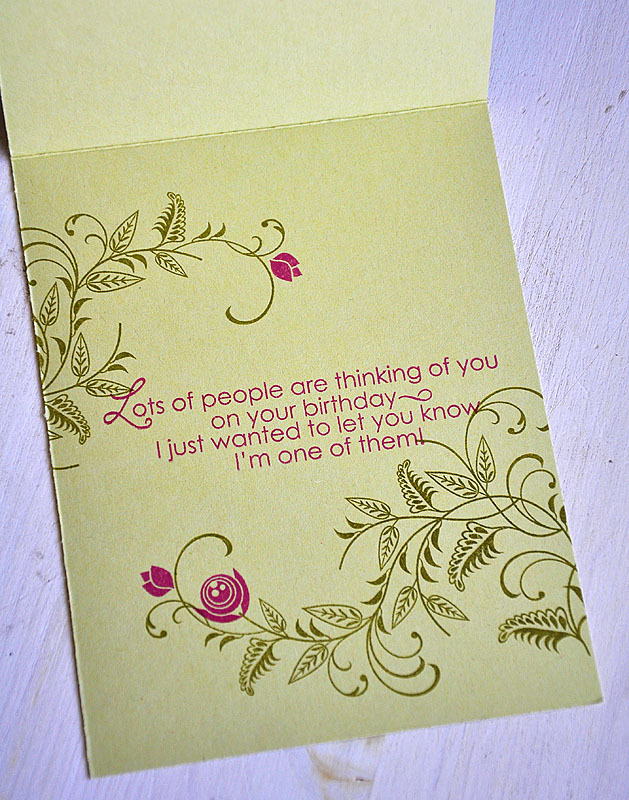 So, this ones for you Mom... For today's card, I've used only one of the focal images... the Cardinal. 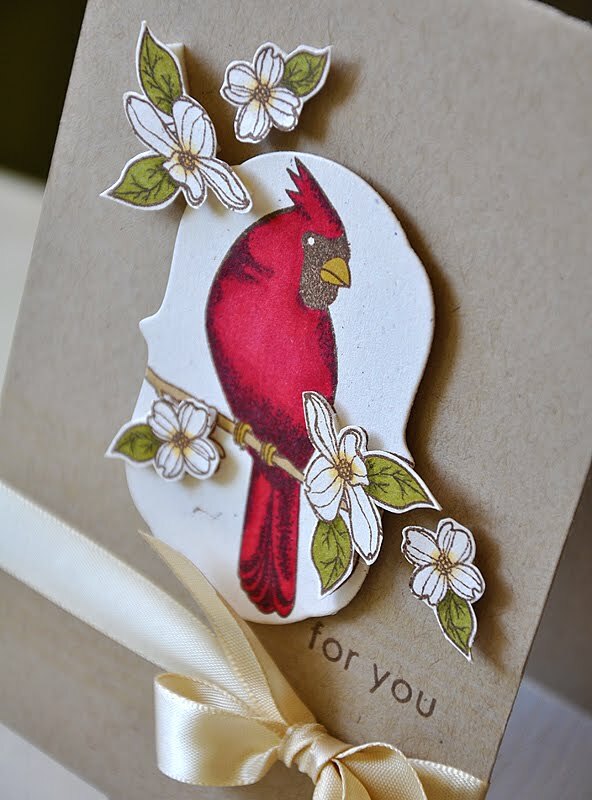 The Cardinal comes perched on a dogwood branch, which I stamped onto a die cut Rustic Cream frame. Colored with Copics and attached to a kraft card base. It may be a little hard to tell in the photo, but I stamped a row of woodgrain (using an image from Woodgrain Silhouettes) onto the card base before attaching the cardinal. Next, I stamped the Cardinal image two more times, colored the flowers and then cut them out. Attached the flowers over and around the main image, to frame it. Finished it off with a sentiment and Fine Linen silk ribbon. Hello! Hope you had a great weekend. 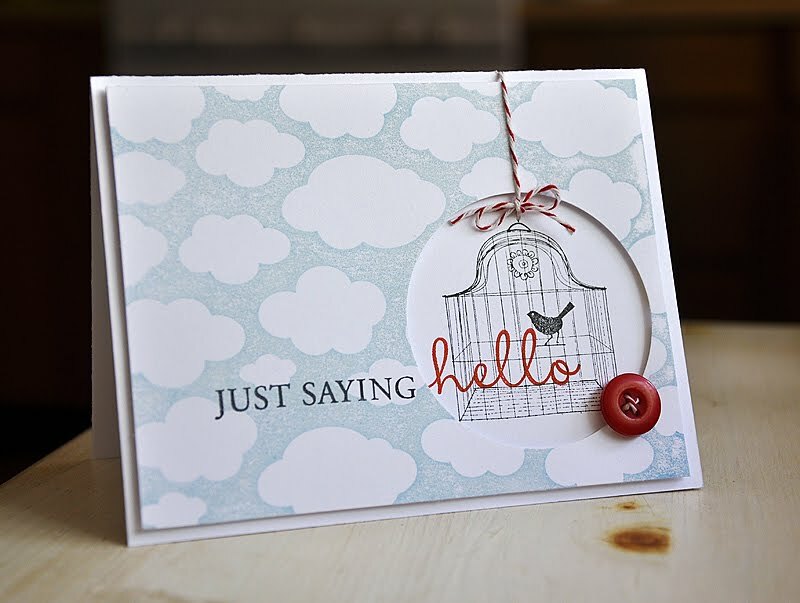 Just popping in to say hello, and to share a little Hero Arts goodness with you today... Today's card started with Clouds DesingBlock stamped, in Spring Rain, onto a white cardstock block. 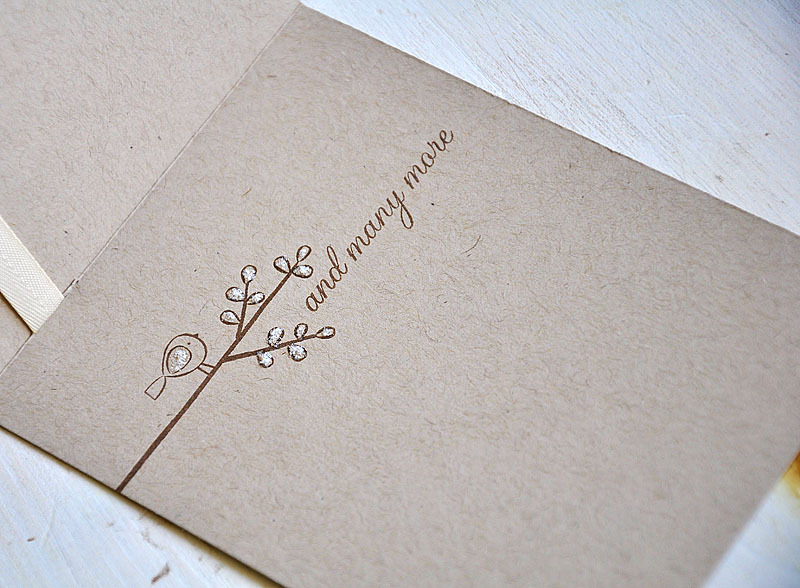 I then punched a circle and stamped a portion of a sentiment (from Truly Appreciated) in True Black. 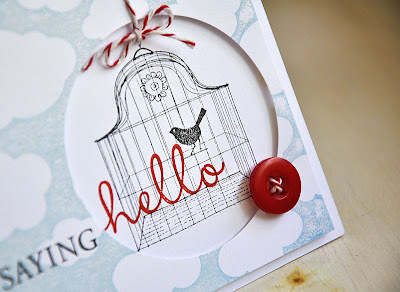 Before attaching the cloud block, I carefully stamped the Bird in Cage and the rest of the sentiment, in Pure Poppy, onto a white card base. Finished it off with a Pure Poppy button and baker's twine. It's time for another Wplus9 All Eyes On, and our focus this time around is on envelopes. 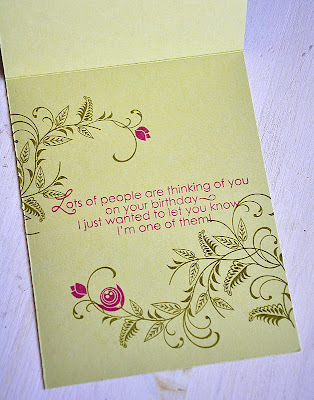 Today I though I would focus on coordinating an envelope with a super simple and mail friendly card. I don't think it gets any flatter than a single layer card... An easy way to create such a card is to layer stamp images. 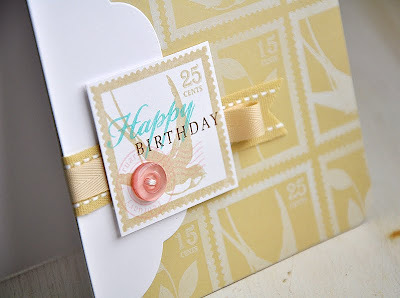 Before I begin stamping, I love to play around and layout my stamps to help me figure out just the right arrangement. Check out this blog post for a better idea of what I am talking about. 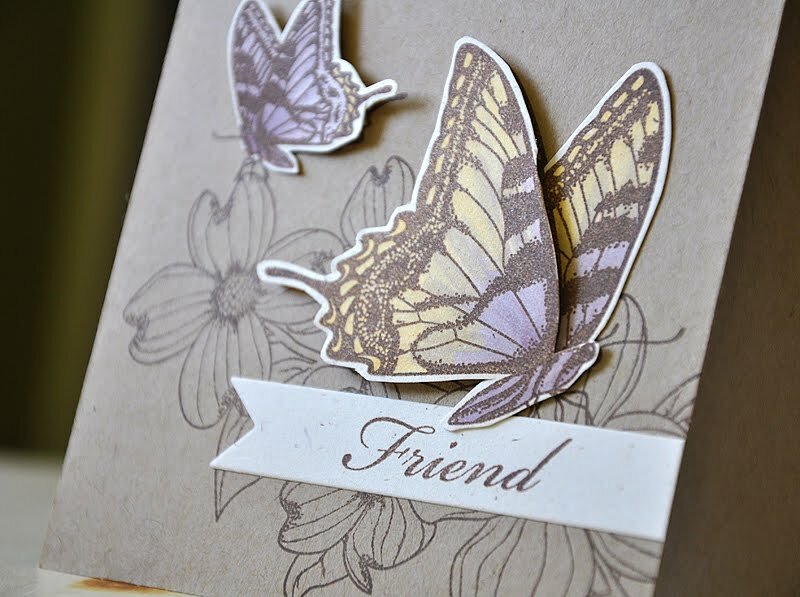 For today's project I've used both Ever After and Woodgrain Silhouettes. On the front of the envelope, I kept the stamping to a minimum and made sure to leave enough room for the addresses. 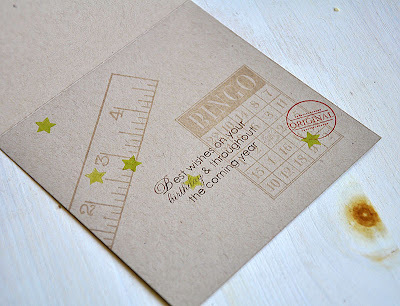 I also coordinated the back flap of the envelope by using the same stamp layout as on the front. I hope you will join us and share your envelope idea with us too! Thanks for stopping by and have a wonderful day. Hello all! I know, things are still very slow around here, my blog (It sure doesn't feel that way here at my house though). I would like to thank you all for bearing with me. Here's an update... I've been having issues with my wrist lately and have recently found out that the pain I've been having was due to Tendinitis of the wrist. Thankfully it is healing quickly and I am not having any more pain when I work and create. My wrist is almost back to normal, yeah! Anyways, on to today's card... This is a super simple card that I had whipped up quite some time ago. I've submitted it to magazines, but it never got picked up. So it's been patiently waiting for me to share it with you. Attached two strips of Plum Pudding ribbon to a Kraft card base. 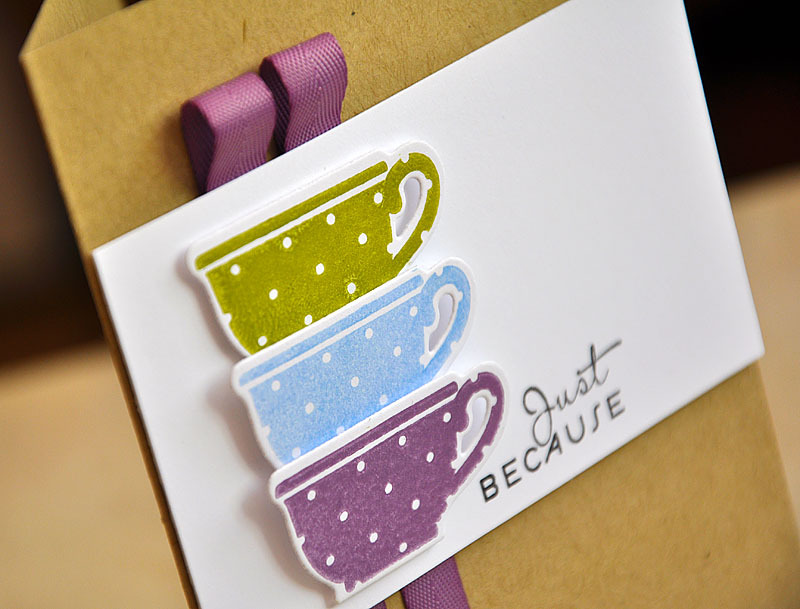 Die cut three tea cups and stamped the coordinating tea cup image in Plum Pudding, Spring Rain & Simply Chartreuse. 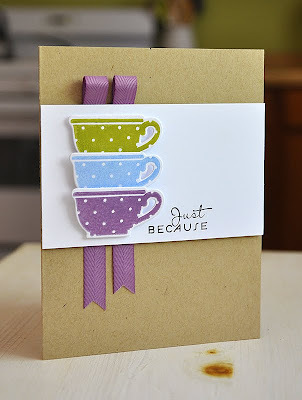 Stacked and attached the cups, with dimensional adhesive, to a white cardstock strip. Stamped the cardstock strip with a sentiment from Asian Fusion and attached to the card base with dimensional adhesive. That's it from me today, thanks for stopping by! 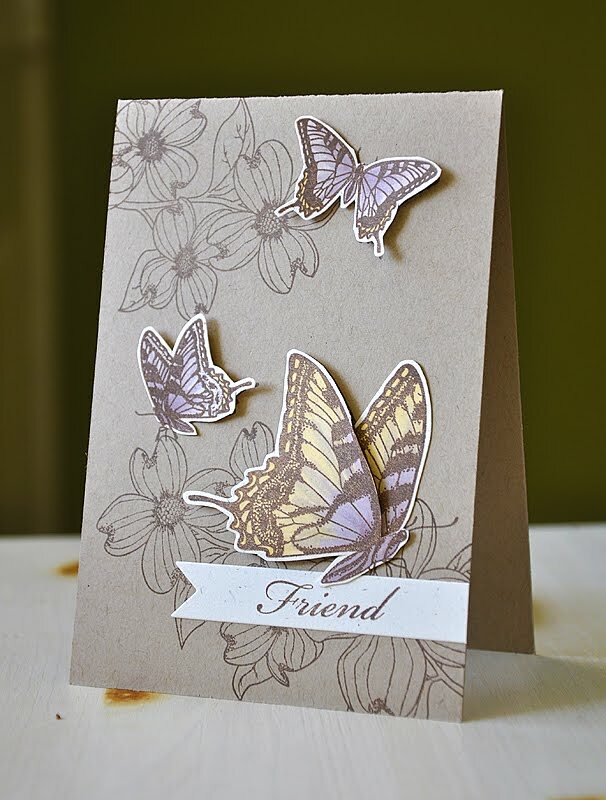 Kept things super simple by grouping a few of these adorable image and embellishing with purple bling. 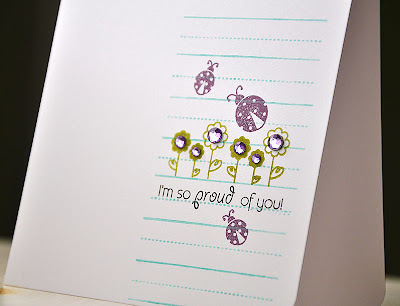 Next up, Simple Sentiments... Love the design of these sentiments. I paired this set with the new Cupcake Collection Dies and the Mat Stack #5 Die. 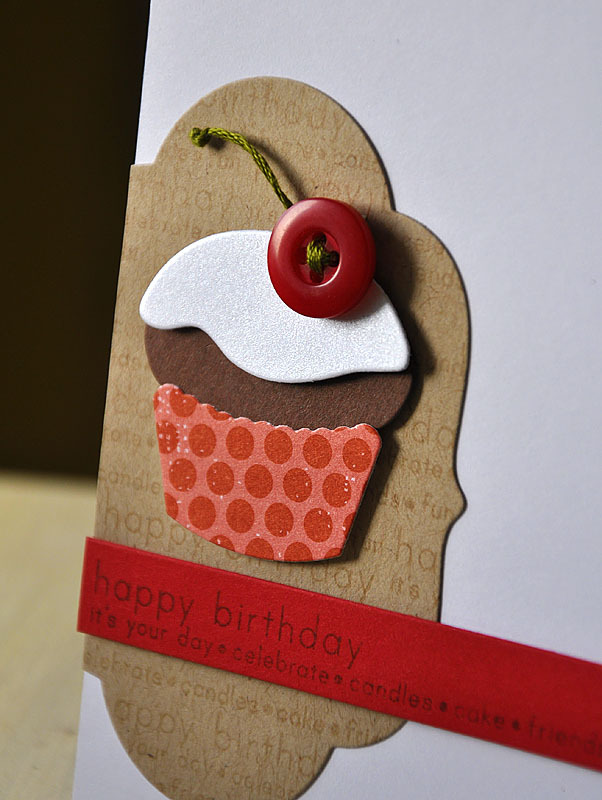 Die cut and assembled the cupcake from Distressed Dots pattern paper, Dark Chocolate & White Shimmer cardstock. Topped it off with a super cute button cherry, love it! 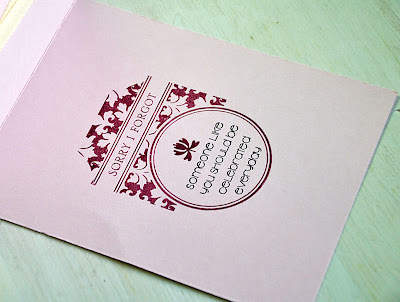 Stamped the carnations in Sweet Blush, Raspberry Fizz & Pure Poppy. Die cut the bottom of the card using the new Edgers #1 Die and then attached a strip of Pink Shimmer cardstock. Stamped one of the sentiments into a Mat Stack 3 Collection square frame image and stamped a floral sprig from Asian Fusion. Dressed things up a bit with some lovely French Knots. So there you have it! All the supplies used are listed in the Papertrey Ink gallery. Hope you've enjoyed the goodies from yet another fabulous release! I'd love to hear what you all are looking forward to receiving the most from this months release! Can't wait to see what you create! I have a few friends (and quite possibly myself, wink!) 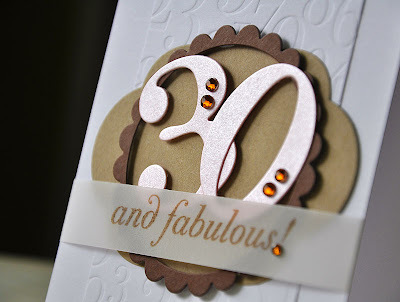 who will be celebrating their 30th birthday this year. 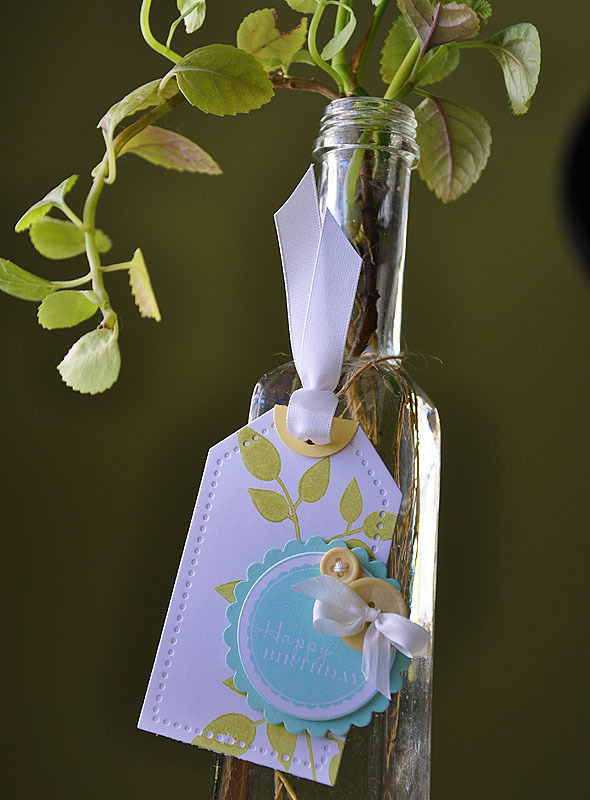 How fitting would it be to create a unique and personal creation for the occasion! Big Birthday Wishes and By the Number Die Collection makes personalizing as easy as 1...2...3..! For today's card, I impressed a strip of white cardstock with By the Numbers Impression Plate and attached it to a white card base. Then layered a scalloped circle frame (created using Limitless Layers: 2.5" Circle Collection) over a kraft Mat Stack #5. 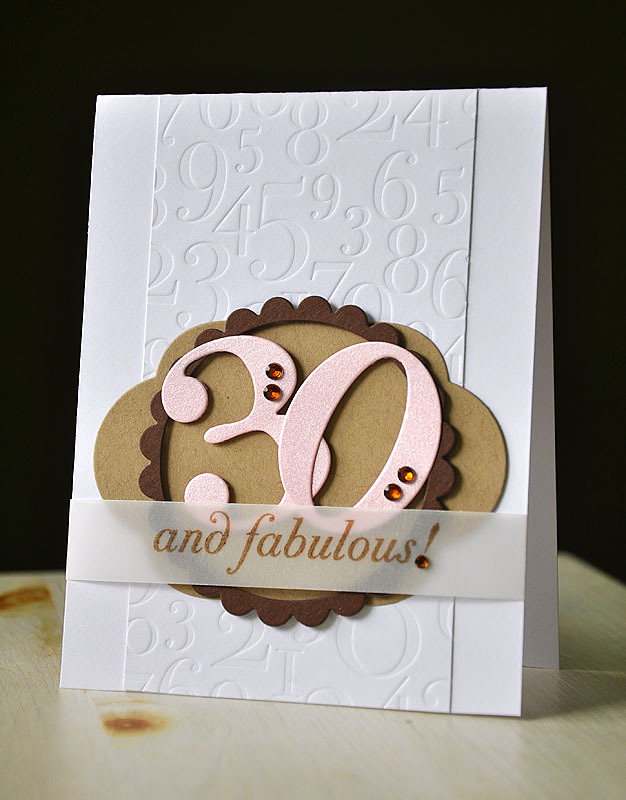 To bling up the numbers for this special occasion, I die cut them from Pink Shimmer cardstock and attached. 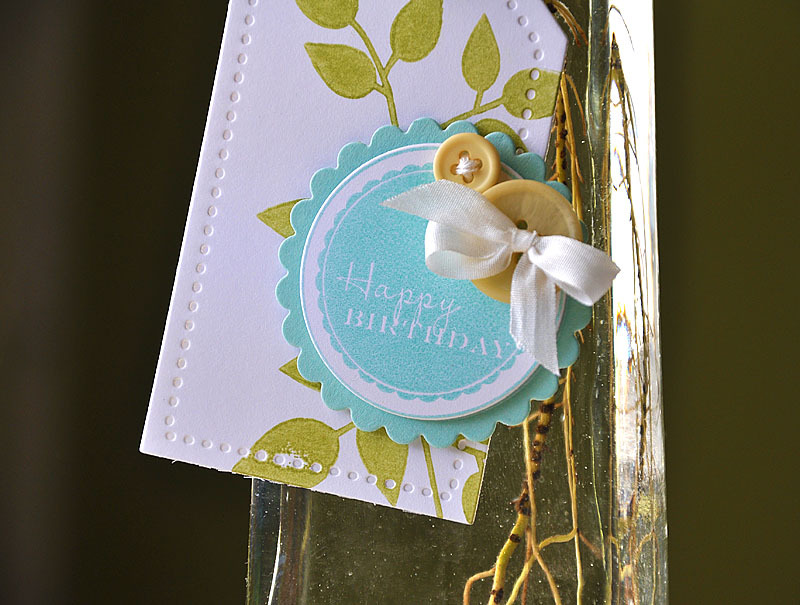 Stamped the sentiment, from Big Birthday Wishes, onto a strip of vellum and wrapped around the card base. Finished the card off with a few brown rhinestones. When you are in a rush to put something together, at the very last minute, tags are usually the way to go. Here's an idea that can be whipped up in as little time as 10-15 minutes. A Tag Sale #3 die cut from white card stock, which I stamped with leaves from Turning a New Leaf in Spring Moss. Topped it off with a Lemon Tart tag tab and white satin ribbon (using this technique). Offset and attached an Aqua Mist scalloped circle and layered a stamped "Happy Birthday" circle (from 2011 Birthday Tags) on top with dimensional adhesive. I love the perfect simplicity of this tag image. Just enough white space was left above the sentiment, which allows for perfect placement of an embellishment. In this case, I embellished with a couple Lemon Tart buttons and white silk ribbon. Thanks for stopping by, have a wonderful day! Thanks for joining me today, everyone! 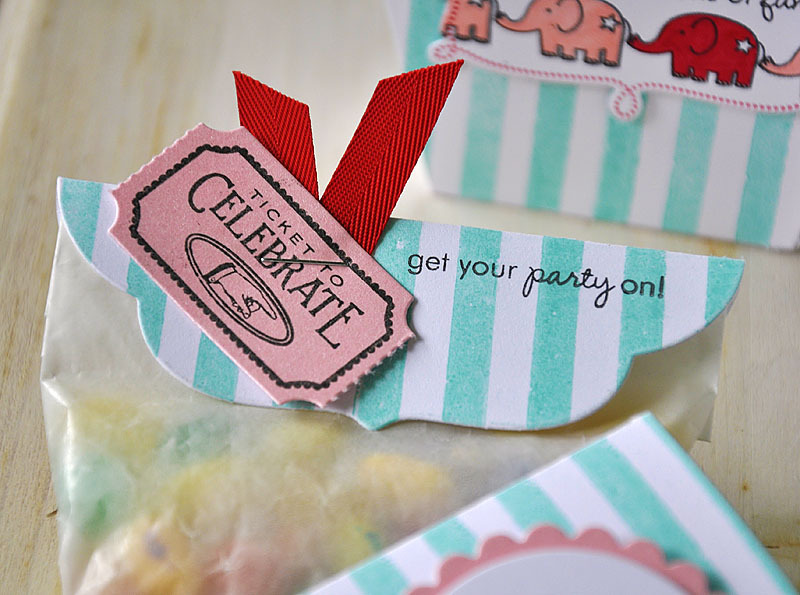 Welcome to this months Papertrey Ink Design Team Group Post (or shall I say, party!). 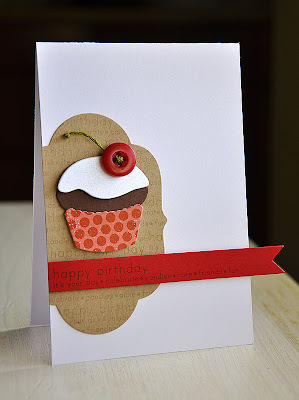 Our assignment for today was to create a fun birthday project using the, soon to be released, Tiny Treats: Birthday. My choice for today's special birthday project was to go with a Carnival/Circus theme, with a bit of a girly twist. 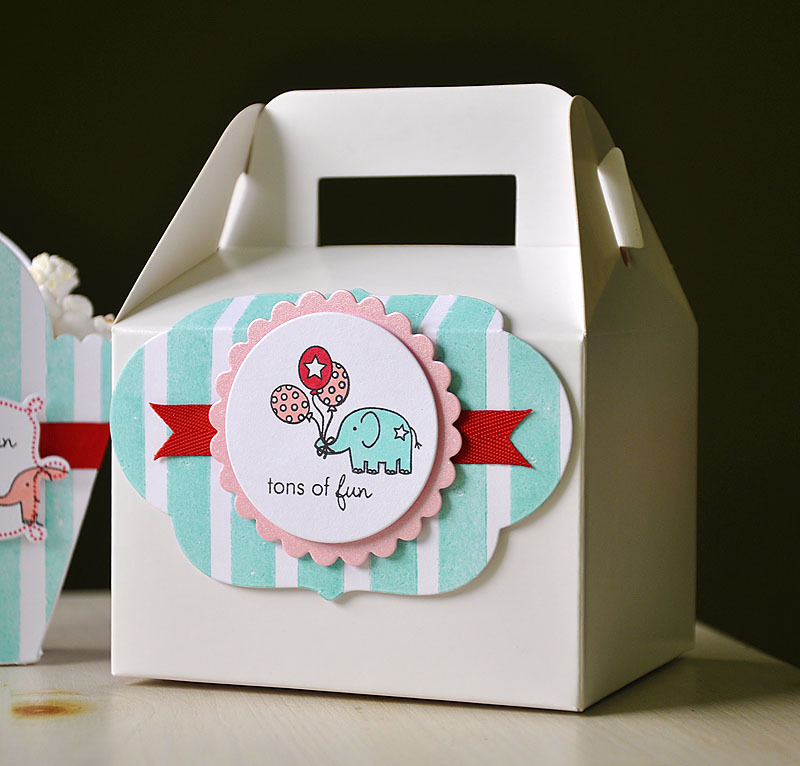 The adorable elephant image, from Tiny Treats: Birthday, plays into this theme perfectly! And for the girly twist, I used a color combo of Aqua Mist, Pure Poppy and Pink Shimmer. 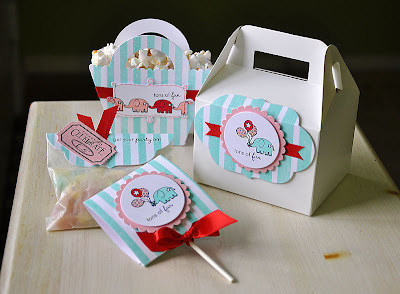 Here is how the ensemble starts... a goody box (with special treats tucked inside) and a popcorn box. Don't those fun Aqua Mist stripes remind you of a Big Top ten?! 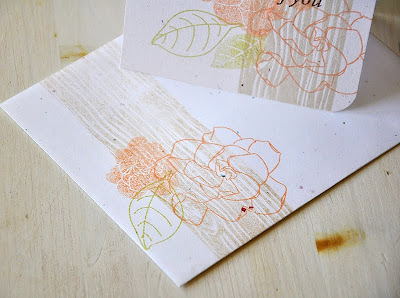 Stamped them using Distress Strips. 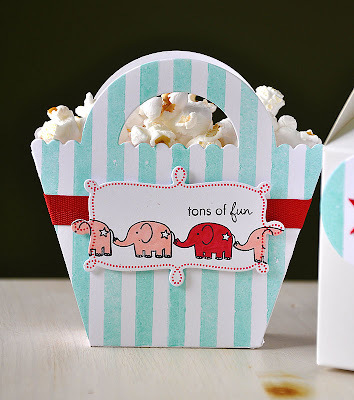 Can't have a circus or a carnival with out pop corn, can you?! 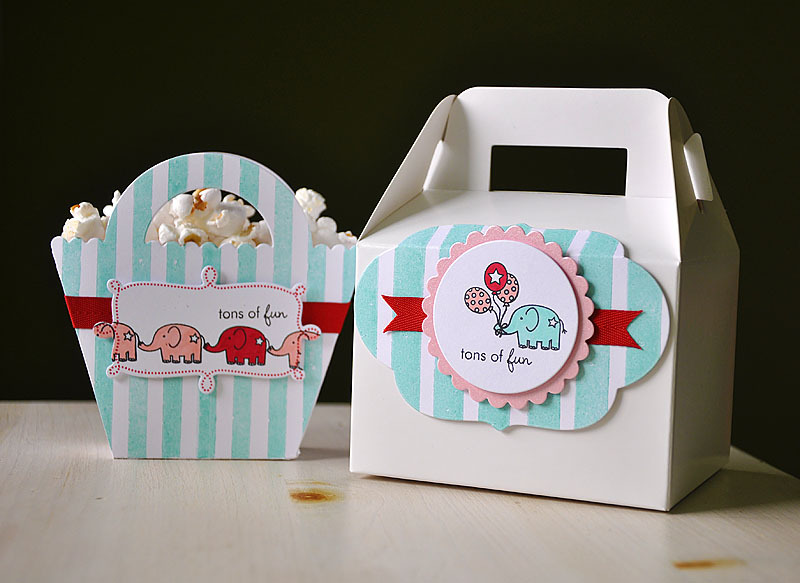 I envision these cute Favor It Box #2 boxes displayed on a table, next to a great big popcorn popper, just waiting to be filled! 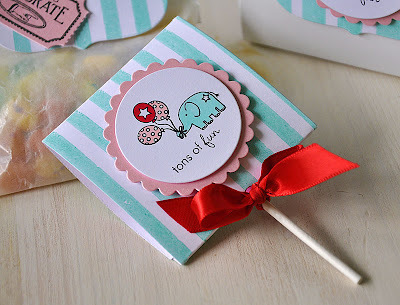 For a fun touch, I stamped a row of elephants onto a Fillable Frames #12 die cut and colored with Copics. And to send the guest home with a smile, how about a Small Gable Box filled with tasty treats?! I love how both the balloon and elephant image work so perfectly together! 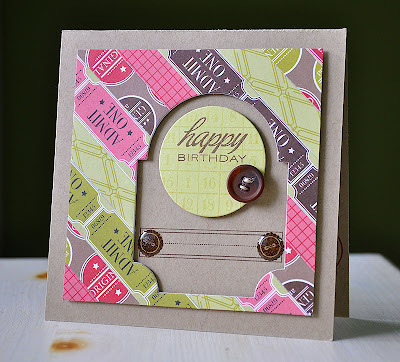 A fun use for the new Lunchbox Note Die! 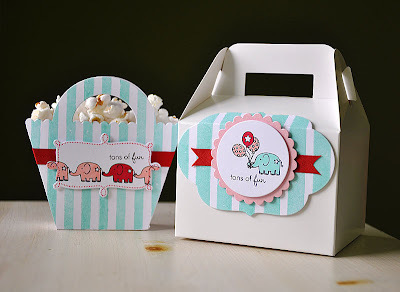 Simply punch a hole, insert a sucker, hold it in place with a bit of adhesive, fold and decorate. You've got your self a cute little sucker holder! Inside you will also find a Glassine Bag, filled with jelly beans and topped with the new Mat Stack #5. Once the glassine bag was filled I folded the top down, scored the Mat Stack down the middle, stamped the sentiment (also from Tiny Treats: Birthday) and folded over the top. 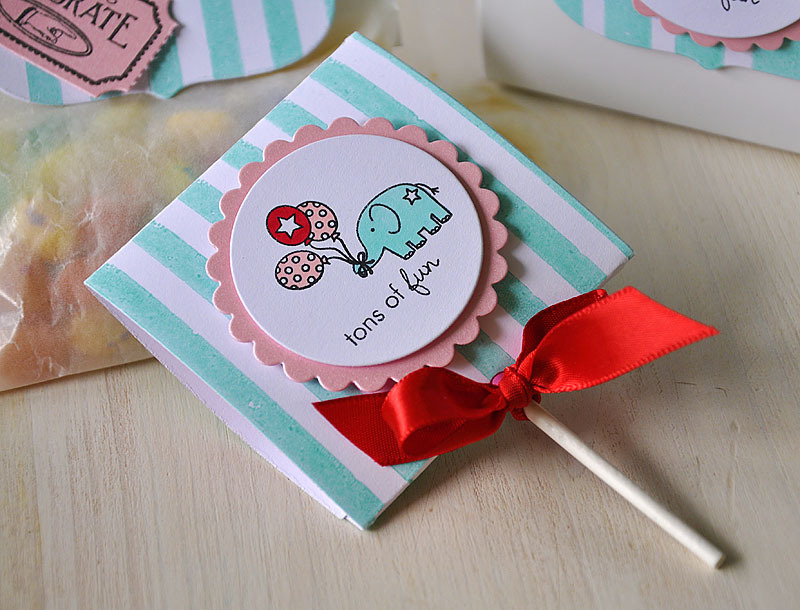 I then placed a strip of Pure Poppy ribbon, placed a hand stamped tag (from Just The Ticket) and stapled. Here's one last look at the entire ensemble. Here's A Tip: For a boy friendly them, substitute Orange Zest for the Pink Shimmer accents and Spring Rain for the Aqua Mist strips. Hello and welcome! Today is day 3 of the Papertrey Ink Countdown and I do hope you are enjoying everything so far. I am super excited to be sharing two new sets with you today... Mat Stack #3 Collection, the next in the series that coordinates with the Mat Stack #3 die. And, Inside & Out: Birthday, a set perfect for completing both the inside and outside of those popular birthday cards. Both sets will be available for purchase on January 15th. Today I bring you four birthday cards, and each of them contain a sweet surprise inside... First up, this fun polka dot frame from Mat Stack #3 Collection. Which I paired with an oldie but goodie set called With Sympathy. 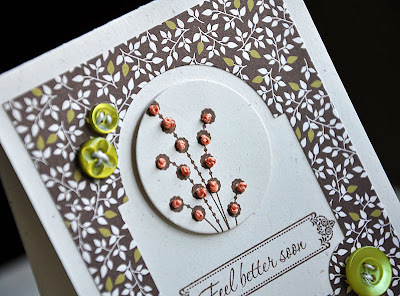 Stamped a Spring Moss card base with the vine image, from With Sympathy, in Ripe Avocado. Then stamped a few blossoms in Raspberry Fizz. Die cut and stamped the Mat Stack #3 polka dot frame in Sweet Blush and a sentiment (from Inside & Out: Birthday) in Raspberry Fizz. 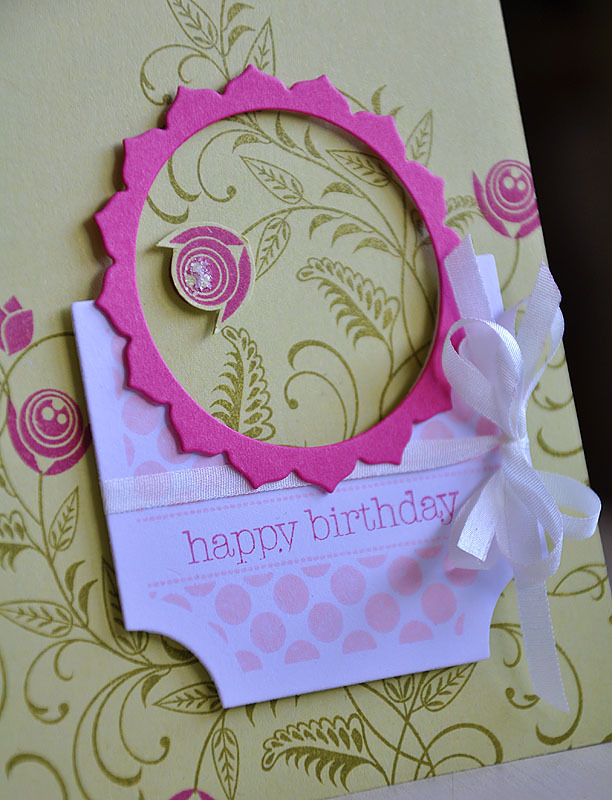 Here's how: To create the opening at the top of the Mat Stack, I started by die cutting a circle from top. 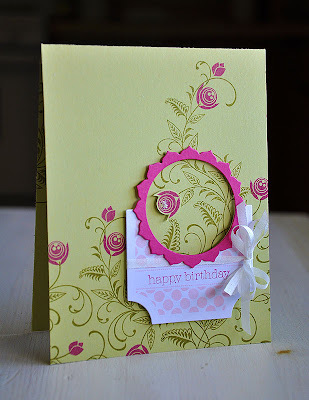 Die cut a scalloped circle from Raspberry Fizz cardstock, die cut a circle from the center and then attached over the Mat Stack opening (Circle dies from Limitless Layers: 1 3/4" Circle Die Collection). Wrapped the Mat Stack with white silk ribbon and then attached to the card base with dimensional adhesive. To complete the card I stamped the vine image, in Ripe Avocado, along the bottom and top of the inside of the card. 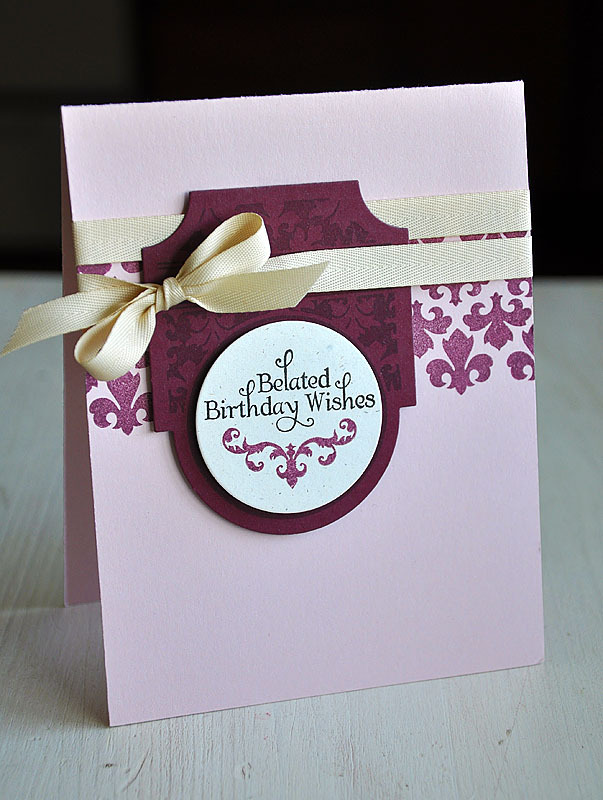 A sentiment, from Inside & Out: Birthday, and three blossoms in Raspberry Fizz. Next, I paired one of the rectangle images from Mat Stack #3 Collection with It's Official. Cut a square from cardstock and attached It's Official pattern paper strips on top and then trimmed off the excess. Die cut a Mat Stack #3 from the square and attached to a kraft card base with dimensional adhesive. 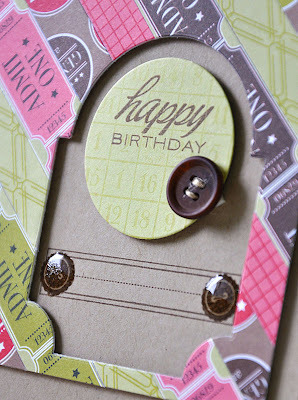 Stamped the button rectangle (from Mat Stack #3 Collection), in Dark Chocolate, within the die cut opening. Die cut a circle from Spring Moss, stamped with the bingo card (from It's Official) and a sentiment (from Inside & Out: Birthday), attached with dimensional adhesive and embellished with a Dark Chocolate button. Layered a little Glossy Accents over the stamped buttons for a bit more of a realistic look. 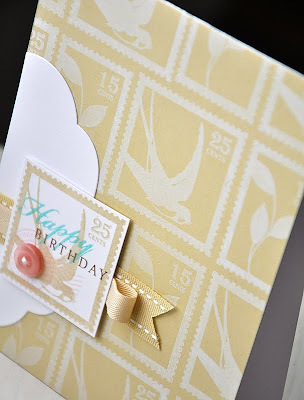 On the inside, I layered a few stamped images (from It's Official) in Simply Chartreuse, Pure Poppy and Versamark inks. Then a sentiment (from Inside & Out: Birthday), stamped in Dark Chocolate, to finish it off. For this simple number, I paired Damask Designs with the damask frame from Mat Stack #3 Collection. Stamped the damask background builder image, in Scarlet Jewel, across the front of a Sweet Blush card base. Wrapped Fine Linen twill ribbon around the card base twice and tied into a bow. 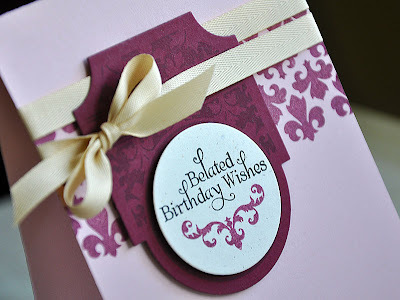 Die cut a Mat Stack #3 from Scarlet Jewel cardstock and stamped with the damask frame image in Versamark. Tucked the Mat Stack between the wrapped ribbon and attached it to the card base with dimensional adhesive. Die cut a circle from Rustic Cream cardstock, stamped with a sentiment from Inside & Out: Birthday and a flourish from Mat Stack #1 Collection and then attached. Inside, I stamped the same Mat Stack image, "Sorry I Forgot" (from Big & Bold Wishes) and a small flourish (from Mat Stack #1 Collection) in Scarlet Jewel. 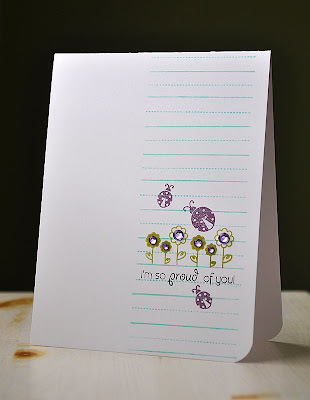 Finished it off with a heartfelt sentiment (from Inside & Out: Birthday) stamped in True Black. And finally, for this little cutie I paired Little Bitty Bird with the checkered frame from the Mat Stack #3 Collection. 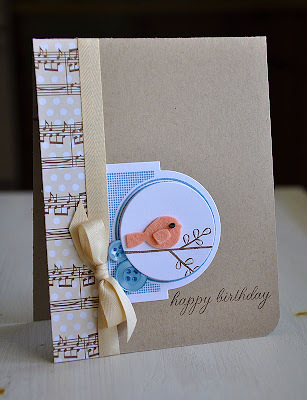 Attached a strip of Sweet Symphony pattern paper along the edge of a kraft card base. 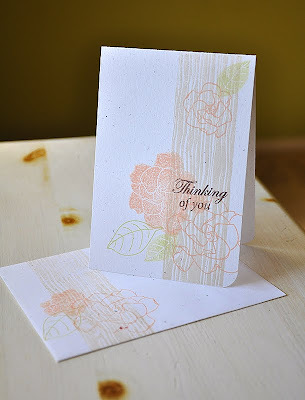 Die cut and stamped the Mat Stack image (using Stormy Sky Distress ink) onto white cardstock. Trimmed off the bottom of the Mat Stack and attached along the pattern paper edge. Wrapped the card base with Fine Linen twill ribbon and rounded the bottom corner. 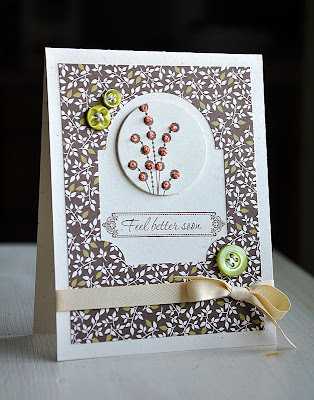 Stamped a die cut circle with a branch in Dark Chocolate and attached with dimensional adhesive. Embellished with Blueberry Sky buttons, a Melon Berry felt die cut bird (using the Little Bitty Bird die) and Rock Candy Stickles Glitter Glue. 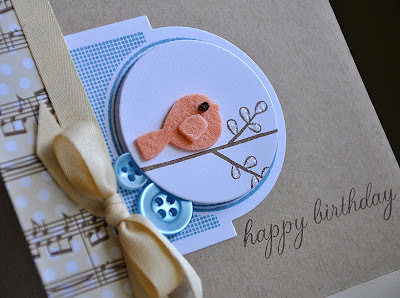 Here's a tip: To create the perfect bird wing, trim off the tail of a smaller die cut bird (using the Little Bitty Bird die) and attach over the bird body. Finish the bird off with a french knot eye and then attach. To coordinate the inside with the outside, I stamped the same branch across the inside top. Perched a bird above and a sentiment (from Inside & Out: Birthday) below. Then embellished with more Rock Candy Stickles. I love the unexpected touch of glitter on the inside. Thanks for stopping by and I hope you enjoyed! Hello all! 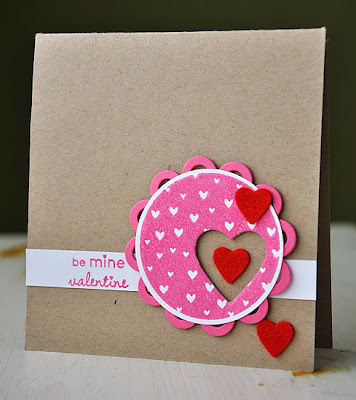 Just quickly popping in to share a simple Valentine's Day card using 2010 Love Tags... Today's card started with a die cut Hibiscus Burst scalloped circle. Die cut a circle from the center of the scalloped circle (both dies are from Limitless Layers: 1 3/4" Circle Die Collection). Then stamped the solid heart circle image in Hibiscus Burst, punched it out, die cut a heart from the center, layered over the scalloped circle and attached it to the card base with dimensional adhesive. 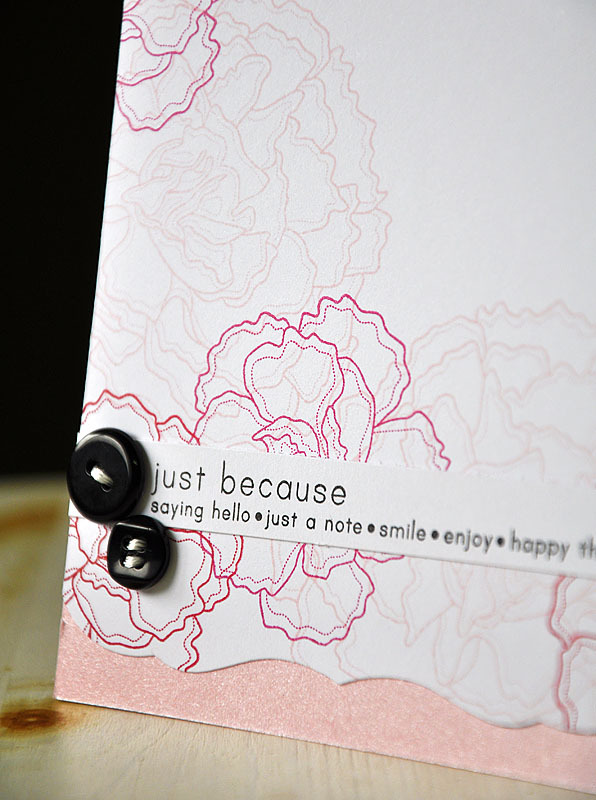 Attached white cardstock strips to either side of the circle and stamped with a sentiment in Hibiscus Burst. 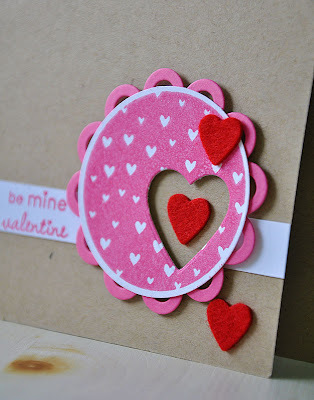 Finished the card off with a few die cut Pure Poppy felt hearts. That's it from me, hope you have a great one! Accessories: Pure Poppy Felt, Limitless Layers: 1 3/4" Circle Die Collection, Heart Prints Die Collection & 2" Circle Punch. Hello and Happy New Year to you all! Forgive me for my unannounced leave of absence. I really didn't expect to leave you hanging for so long. I've had a lot on my plate these days and just needed time to focus on my family and my ever growing to do list. I've got some new and exciting ventures coming up, but I can't share at this time. However, I did want to let you know that I am fine, and thanks to those who contacted and checked in on me. It sure is nice to know that I was missed! Today's card is in honor of the New Year and Valentine's Day. Pulled out an older set, Luck of the Irish , for this one... Started with a white base and then impressed it with the Linen & Canvas Impression Plate. 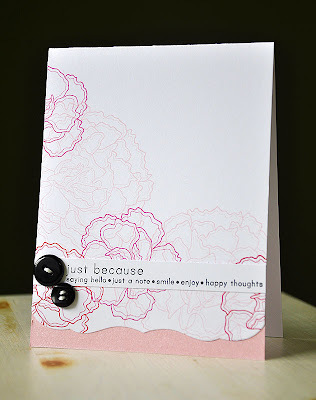 Stamped a row of frames (in Pure Poppy and Raspberry Fizz) and a sentiment (in True Black) onto a strip of cardstock. Attached the strip to the card base with dimensional adhesive. Finished the card off with a True Black heart (also impressed with the Linen & Canvas Impression Plate) and a few True Black Buttons and white twine. Thanks for stopping by today and have a great weekend!